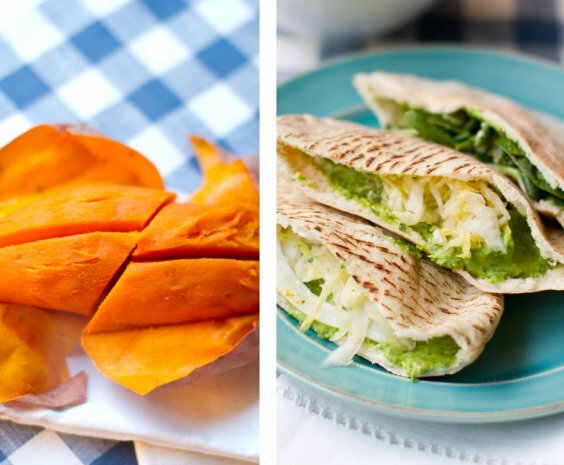 Spinach Hummus Pitas, Sweet Potato. Easy Dinner! Here is an easy dinner idea for your busy week ahead. My Spinach Hummus Pitas paired with a large baked and maple-mashed sweet potato. 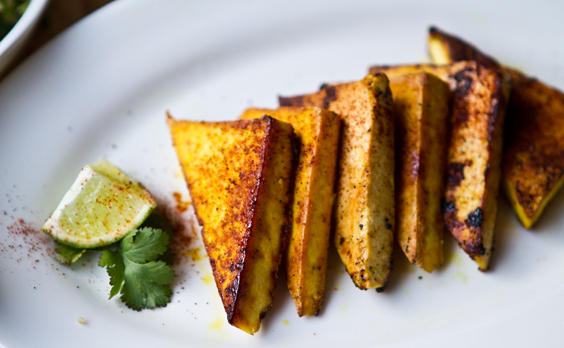 Served with a side of smoky baked tofu squares and pepper truffle shiitake mushrooms. Picnic-inspired. This recipe would make a wonderful eat-outside feast for spring/summer. Get my recipes (and a vegan dessert idea too!).. 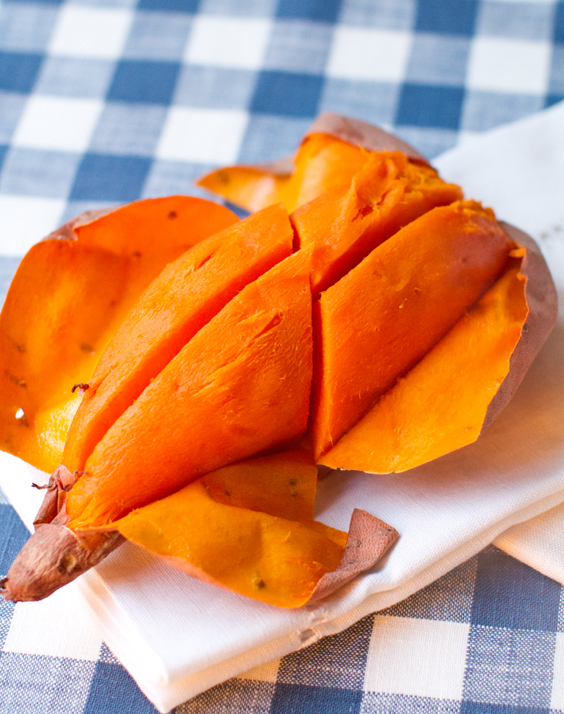 Steamy, oven-baked sweet potato. Aka, My favorite thing ever. Spring-y and Picnic-inspired... We had this casual, picnic-y vegan spread for dinner last night - it was so delicious AND easy (yet still quite a full feast) I had to share. You will notice the absense of tofu and shiitake photos - that is because the sun was fading (bye bye natural photo lighting) but mostly because everything smelled so yummy I just wanted to dive in. More Veggies. 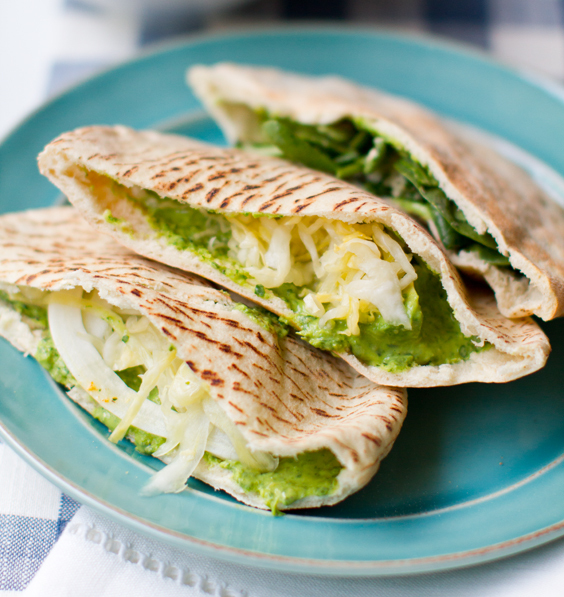 If you want to stuff more veggies in your pitas than I did in the photos - go for it. 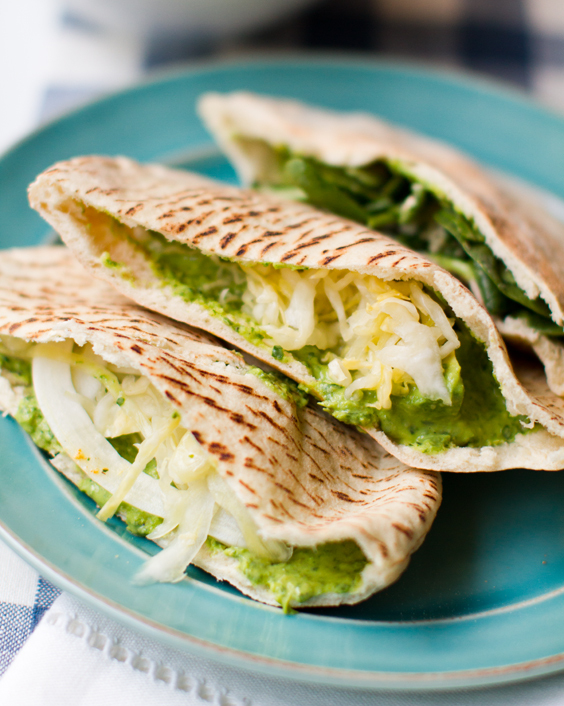 That's why pitas are so rad - you can cram lots of healthy veggies, fruit, nuts, seeds, beans and more in them. I served the pitas alongside a few of my favorite sides. A sticky-sweet baked sweet potato mashed with a drizzle of grade B maple syrup and a pinch of salt. Then some fresh shiitake mushrooms - sauteed with various spices, a splash of wine and a hint of truffle oil. And lastly, I served some baked tofu squares which I literally just very simply sliced, tossed in some dry spices, salt/pepper, tiny drizzle of oil and baked. This was easy and amazing. I will be making this meal again! Hope you can try it too. This spinach hummus is a bit on the thin side - but that was what I was going for since the creamy chunks of avocado get folded into the mixture. 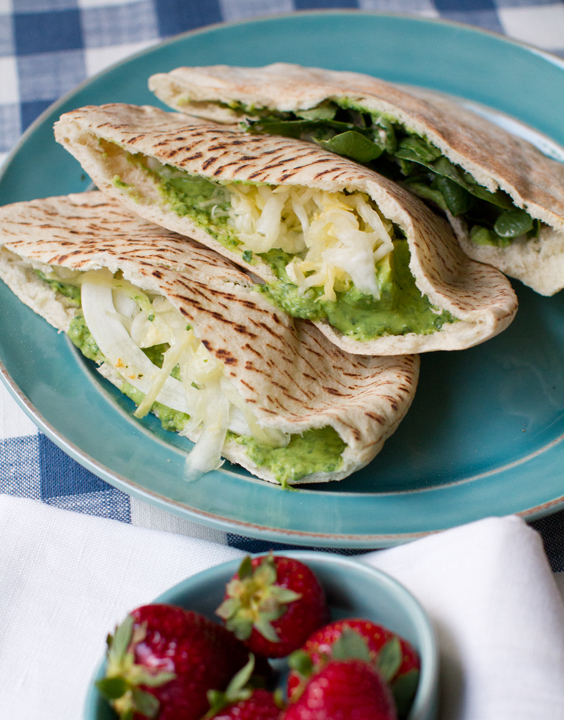 This hummus fills the toasted dry pitas perfectly - with plenty of lemon-y flavor. Directions: process in Vitamix or food processor until smooth and creamy. I needed my plunger for Vitamix blending - to get all the spinach pressed down. Pour into bowl. Fold in the avocado chunks. Toast pitas. Add hummus to inside of pitas - generously. Add a few pinches chopped spinach and chilled sauerkraut. 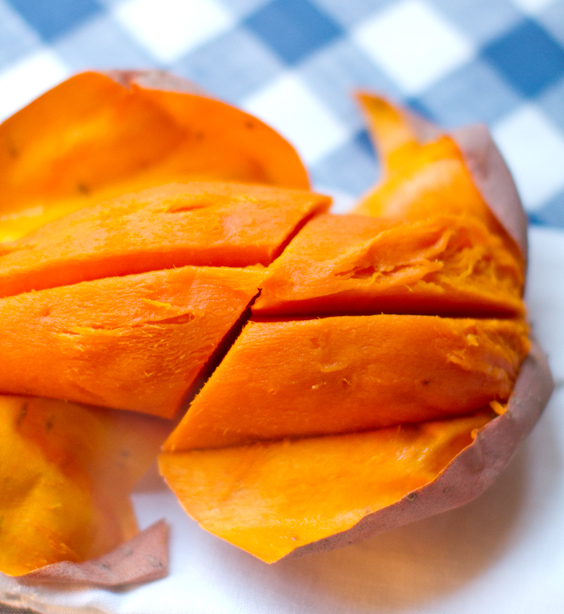 * 1 large sweet potato, oven baked (400 degrees for 30 minutes) - mashed with maple syrup, s&p and optional smoky spices. * small side of shiitake mushrooms, thinly sliced and sauteed win 1 tsp truffle-infused oil (or any veg oil) + s&p to taste + a splash of wine added towards middle of cooking process. Want dessert with that? 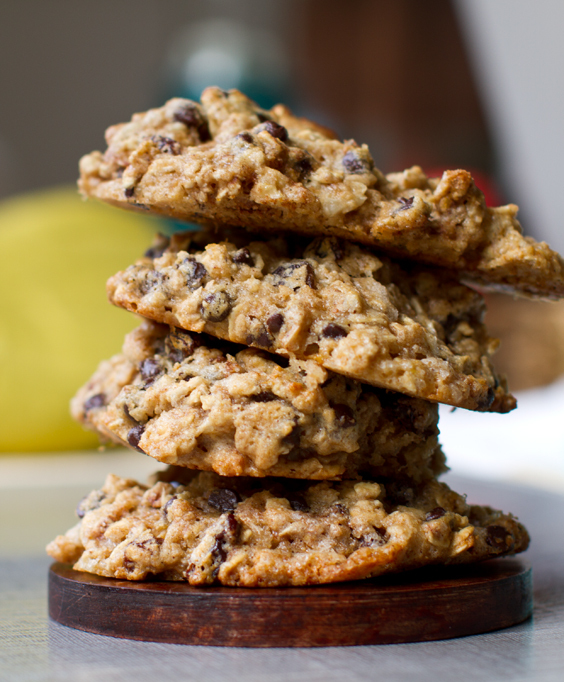 Try my Chocolate Oat Pantry Cookies - recipe on Babble.com's Family Kitchen..